Barry Schatz thought losing weight was a sign his exercise plan was working. Instead, the 47-year-old father of two learned in 2000 that he was losing weight due to chronic myelogenous leukemia, a cancer of the blood-forming cells of the bone marrow. Schatz was fortunate to get treatment through a clinical trial that gave him Gleevec, which has since become a first-line therapy. However, after about a year, it stopped working, and a bone marrow transplant became Schatz’s only option for survival. He received the transplant, in which healthy donor marrow replaces a patient’s diseased marrow, at the cancer center where he works. It was a success. The process made Schatz realize he wanted to do even more than he already was doing for people with cancer in his position at Loyola. So eventually, he became a partner on a PCORI-funded project working to identify and build the foundation for studying the impact of transplants on recipients’ quality of life. Until recently, patients, clinicians, and researchers considered a bone marrow transplant successful if the recipient lived. Fortunately, because the number of transplant survivors has increased, the research spotlight is now also focusing on the near- and long-term challenges survivors face. After his diagnosis, Schatz’s concerns turned toward his family—his wife and children, who were then 10 and 7. That focus has extended to the work he’s doing with support from a PCORI Engagement Award to the National Marrow Donor Program. The project looks to “add the views of patients and their families to the clinical perspectives that medical people generally bring to research,” he says. Bone marrow transplantation is generally not first-line treatment for marrow and other blood cancers. It can require weeks to months of hospitalization for monitoring and treatment and it can have many side effects, including pain, fever, chills, nausea, bleeding, and infection risk. Some can be life-threatening. But more and more transplant recipients are surviving. 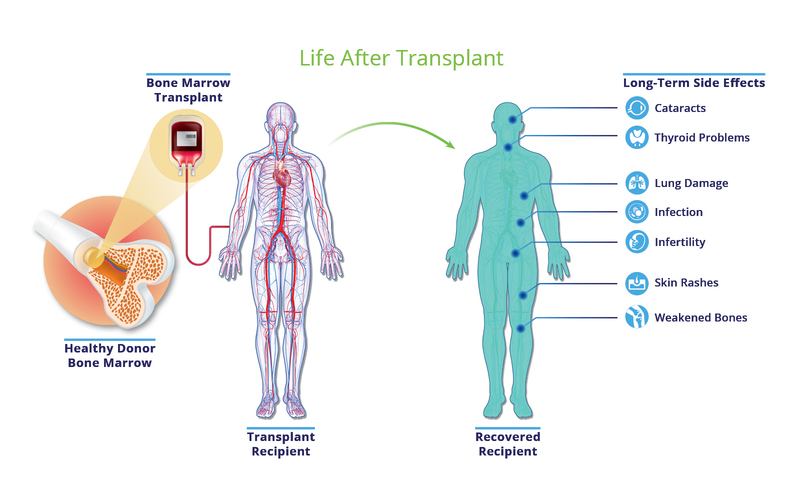 In the past five years, the number of patients alive one year after receiving a transplant from an unrelated donor increased from 42 to 60 percent, according to the National Marrow Donor Program. In 2009, there were approximately 110,000 transplant survivors; experts expect around 240,000 survivors by 2020. Linda Burns, MD, Vice President and Medical Director of Health Services Research at the National Marrow Donor Program, has watched the transplant world’s focus shift from curing people of a serious disease to also recognizing and addressing long-term effects of those cures. Burns’s experience made her want to know more about improving the quality of patients’ lives. “Instead of saying, ‘Here’s what we think researchers and patients need,’ we said, ‘Let’s ask the patients,’” she says. To try to do that, Burns and her team held three symposia with patients, caregivers, clinicians, researchers, and other stakeholders to find out what questions about bone marrow transplant outcomes they thought should be top research priorities. Participants divided into work groups that identified knowledge gaps, took part in webinars about patient-centered outcomes research, and discussed potential research questions. The work groups developed research questions on six topics: physical health, including fatigue; emotional, cognitive, and social health; sexual health and relationships; care delivery; financial burden; and education and support for patients, caregivers, and families. What is the most effective delivery method for education about the emotional and physical aspects of recovery from bone marrow transplant? Does the distance from patients’ and caregivers’ homes to a bone marrow transplant center predict the strength of their belief in themselves to handle the transplant process? What are the potential benefits of a peer support group for adolescents and young adults facing chronic illnesses and receiving bone marrow transplants? What interventions can prepare survivors for communicating their health history to current and future romantic partners? Schatz joined the family-centered work group. He says sometimes families don’t receive the support they need to address ongoing emotional and health issues, such as the skin rashes and immunity concerns he still experiences. The work group zeroed in on families’ needs for emotional support and educational material. The group suggested family members receive tools for dealing with stress, for example. Participants thought an important research question would address which methods best provide such support, such as whether one-on-one or group settings were more effective. Another participant in the work group, Susan Kullberg, a retired teacher, says hospital support groups sound helpful but can sometimes cause stress. Hearing about others’ experiences, especially in cases of transplant failure or death, can weigh heavily on families, she says. When Kullberg was a teenager, her father died of Hodgkin lymphoma, another blood cancer. Decades later, she cared for her young grandchildren and 34-year-old daughter, Betsy, when Betsy underwent a transplant for chronic myelogenous leukemia. “In the mid-1960s when my father was diagnosed, no one talked about cancer,” Kullberg says. “When Betsy was diagnosed in 2005, I thought there would be some kind of emotional support for our family. Actually, there was so little.” It would have helped her stay hopeful, she says, to have met someone who had survived chronic myelogenous leukemia. She now volunteers to provide just that kind of support for patients and families. The work group also talked about the importance of educational materials, suggesting they take into account differences in cultures and consider different formats, such as videos versus traditional print. Ultimately, the group posed several research questions for further study, including how levels of distress compare for transplant patients and their families who receive provider-directed education versus those who receive both provider- and self-directed education. The participants in the PCORI-funded project want to see their work have a long reach. After each symposium, the team sent updates about the project to members of the American Society for Blood and Marrow Transplantation, the Center for International Blood and Marrow Transplant Research, the National Marrow Donor Program, and various transplant centers. The symposia’s educational webinars are available for public use on the National Marrow Donor Program’s website. The team recently published its research recommendations in the journal Biology of Blood and Marrow Transplantation. Each work group also aims to develop at least one of their questions into a research proposal. Goal: To develop a research agenda for studying the bone marrow transplant outcomes that are most important to patients and their families.